This is much more than a book of spaceships. In addition to new spacecraft from fighters to dreadnoughts, there are ship creation guidelines, damage tables, additional space gear, discussions about Faster-Than-Light speed, FTL combat, planet-side sieges, strategies, tactics, ranks for each fleet, a time-line, history on key races and their technology, notable figures, ship-building, hints at upcoming events and potential dangers, and much more. 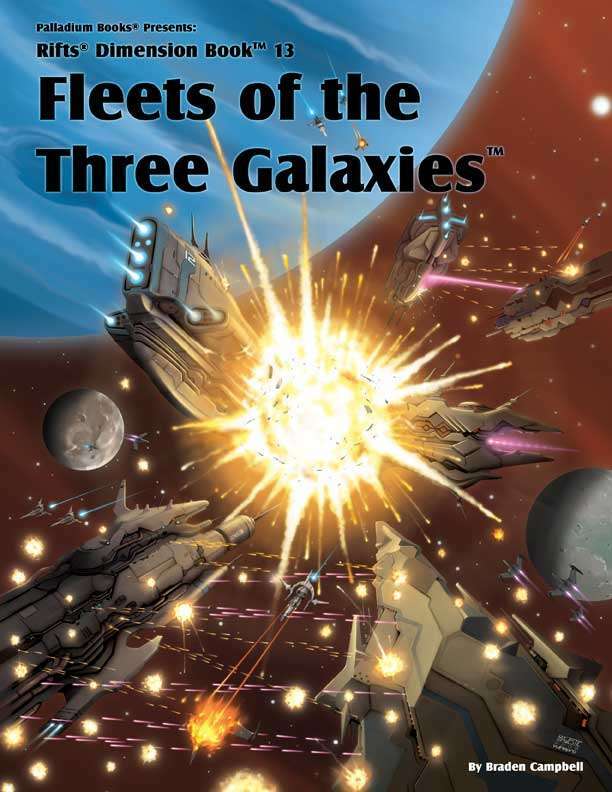 A must for fans of Rifts®, Phase World®, the Three Galaxies™, or space opera. Suitable for use with Robotech®. 17 new spacecraft, from fighters to dreadnoughts. Space tugs, lifeboats, missiles and special gear. Spaceship creation guidelines & classification by type. Random ship damage table, plus strategies & tactics. Fleet formations of the Altess, CCW, TGE, UWW, & others. Space magic spells and Techno-Wizard weapons. Written by Braden Campbell with Siembieda & Marker.